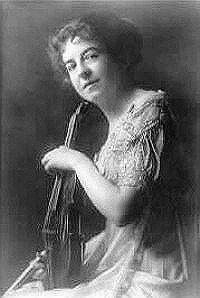 Maud Powell was an American violinist, writer, and arranger born on August 22, 1867 (Brahms was 34 years old.) She is remembered for having been a concert violinist at a time when women violinists – even among orchestral players - were a rarity. Her career was spent almost exclusively in the U.S. Her first violin studies began when she was seven. At age 9 she became a pupil of William Lewis in Chicago. She then began playing in and was soon made assistant concertmaster of the Aurora (Illinois) Symphony Orchestra. Her debut as soloist with this orchestra took place in 1880. She further studied in Europe with Henry Schradieck in Leipzig (1881-1882) and Charles Dancla in Paris (1882-1883.) She spent a year intermittently concertizing in London and then studied briefly with Joseph Joachim (1884-1885) who conducted the orchestra when she gave her Berlin debut with the Berlin Philharmonic in March of 1885 playing the Bruch g minor concerto. Returning to the U.S., she gave her New York debut with the New York Philharmonic on November 14, 1885 again playing Bruch’s first concerto. She was then eighteen years old. She soon began including works by contemporary American composers in her programs, including Arthur Foote, Henry Huss, Victor Herbert, and John Carpenter. She gave the American premieres of the Tchaikovsky and Sibelius concertos. Her fan club claims she premiered the Dvorak concerto as well but that is not true. Max Bendix premiered the Dvorak concerto with the Chicago Symphony on October 30, 1891. Powell gave the first New York performance of the concerto in 1893 but that's all. Mastering a very extensive repertoire, Powell also frequently played the concertos of Saint Saenz, Lalo, Arensky, Conus, and Rimsky Korsakov, among others. Her premiere of the Sibelius concerto on November 30, 1906 was especially significant although this concerto did not enter the standard violin repertoire until after Jascha Heifetz championed it. Powell founded a quartet in 1894 and a trio in 1908. She frequently wrote her own program notes and wrote numerous articles for music journals. I don’t know if she ever took students. Among her many violins was a supposed JB Guadagnini (1775) which was later sold to Henry Ford, the car maker. The Guadagnini was later declared (by Kenneth Warren) to actually be a copy made by New York Luthier George Gemunder on or about 1865. (She had purchased - around 1886 - a violin from a dealer named Victor S. Flechter which turned out to be a fake. Powell later sued the dealer because she had paid $500 and the violin was said to be worth only $40. The violin had supposedly been made by Gaspard Duiffoprugcar in 1515.) Powell also owned a Guarneri from 1731, the Mayseder Guarneri. She did a lot of recording for RCA during the industry’s infancy (1904-1907). YouTube has postings of a few of her recordings. Maud Powell died (in Uniontown, Pennsylvania) on January 8, 1920, at age 52, while preparing for a concert.